German otologist; born at Emmendingen, Baden, Dec. 11, 1847. He was educated at the universities of Heidelberg, Würzburg, Vienna, and Freiburg in Baden; being graduated from the last-named as doctor of medicine in 1871. After a postgraduate course at the University of Berlin and in hospitals in London, he established himself as a physician in Freiburg. In 1886 he tookup the study of laryngology and rhinology under Hack, and of otology under Thiry at the University of Freiburg. In the following year he became assistant to Thiry, which position he held till 1892, when, on the death of the latter, he became his successor as chief physician at the otological dispensary and privat-docent at the university. In 1894 Bloch was appointed assistant professor of otology; and under his supervision the clinic for this branch of medicine was opened in 1899. 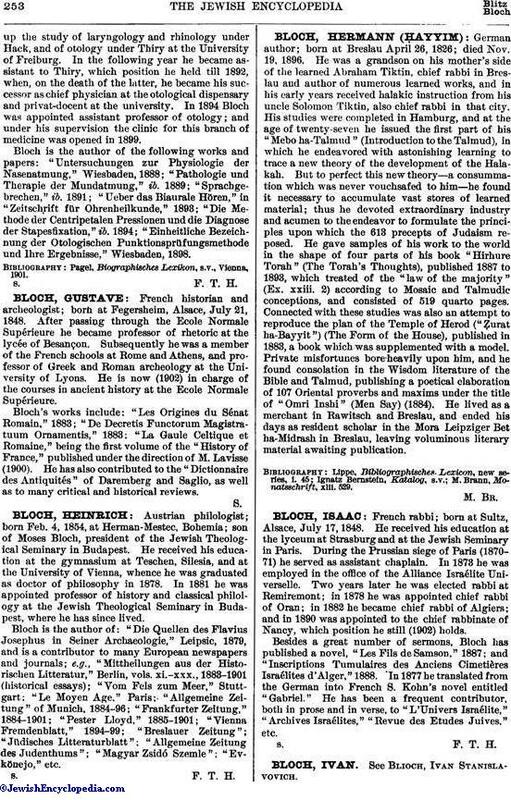 Bloch is the author of the following works and papers: "Untersuchungen zur Physiologie der Nasenatmung," Wiesbaden, 1888; "Pathologie und Therapie der Mundatmung," ib. 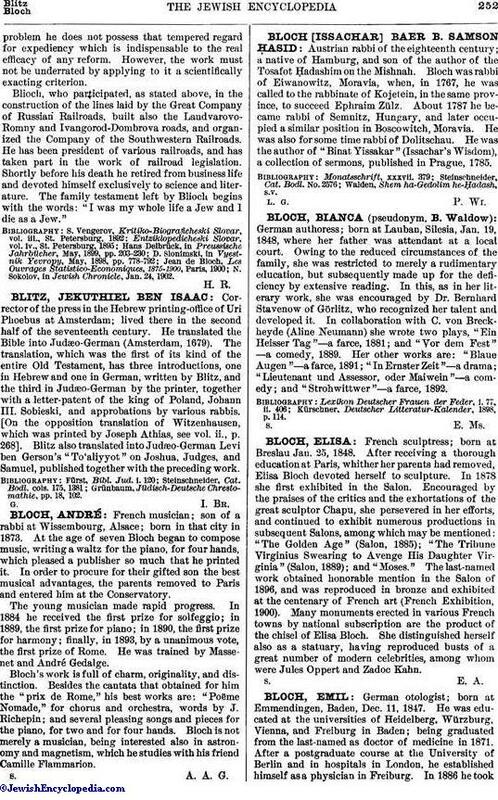 1889; "Sprachgebrechen," ib. 1891; "Ueber das Biaurale Hören," in "Zeitschrift für Ohrenheilkunde," 1893; "Die Methode der Centripetalen Pressionen und die Diagnose der Stapesfixation," ib. 1894; "Einheitliche Bezeichnung der Otologischen Punktionsprüfungsmethode und Ihre Ergebnisse," Wiesbaden, 1898. Pagel, Biographisches Lexikon, s.v., Vienna, 1901.